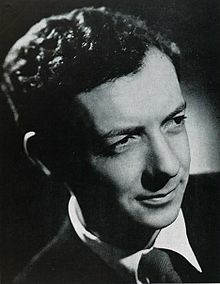 Edward Benjamin Britten, Baron Britten of Aldeburgh, OM CH (22 November 1913 – 4 December 1976) was an English composer, conductor, and pianist. Showing prodigious talent from an early age – he composed his Quatre Chansons françaises for soprano and orchestra at the age of fourteen – he first came to public attention with the a cappella choral work A Boy Was Born. With the premiere of his opera Peter Grimes in 1945 he leapt to international fame, and for the next fifteen years he devoted much of his compositional attention to writing operas, several of which now appear regularly on international stages. Britten's interests as a composer were wide-ranging; he produced important music in such varied genres as orchestral, choral, solo vocal (much of it written for the tenor Peter Pears), chamber and instrumental, as well as film music. He also took a great interest in writing music for children and amateur performers, and was a fine pianist and conductor. Britten was an accomplished pianist, frequently performing chamber music and accompanying lieder and song recitals. However, apart from the Holiday Diary (1934), Piano Concerto (1938), Young Apollo (1939), Diversions (written for Paul Wittgenstein in 1940), Scottish Ballad (1941), he wrote relatively little music that puts the piano in the spotlight, and in a 1963 interview for the BBC said that he thought of it as "a background instrument". One of Britten's best known works is The Young Person's Guide to the Orchestra (1946), which was composed to accompany Instruments of the Orchestra, an educational film produced by the British government, narrated and conducted by Malcolm Sargent. Its subtitle is Variations and Fugue on a Theme of Purcell, the theme is a melody from Henry Purcell's Abdelazar. Britten gives individual variations to each of the sections of the orchestra, starting with the woodwind, then the string instruments, the brass instruments and finally the percussion. Britten then brings the whole orchestra together again in a fugue before restating the theme to close the work. The original film's spoken commentary is often omitted in concert performances and recordings. Britten's church music is also considerable: it contains frequently performed 'classics' such as Rejoice in the Lamb, composed for St Matthew's Northampton (where the Vicar was Revd Walter Hussey), as well as A Hymn to the Virgin, and Missa Brevis for boys' voices and organ. As a conductor, Britten performed the music of many composers, as well as his own. Among his celebrated recordings are versions of Mozart's 40th Symphony and Elgar's The Dream of Gerontius (with Pears as Gerontius), and an album of works by Grainger in which Britten features as pianist as well as conductor. Nocturnal after John Dowland for guitar (1963) has an indisputably central place in the repertoire of its instrument. This work is typically spare in his late style, and shows the depth of his lifelong admiration for Elizabethan lute songs. In each of the eight variations Britten focuses on a different feature of the work's theme, Dowland's song Come, Heavy Sleep, or its lute accompaniment, before the theme emerges complete at the close of the work. Click here to view all items related to Benjamin Britten.